Argus Heating design and manufacture foil heaters for a wide variety of applications where surface heating is required. Foil heaters can be designed to suit your specific application, including different configurations of output, voltage, shape, construction, and terminations. Foil heaters can be manufactured as one-off designs or mass produced in large volumes. When temperature control is required, sensors and over-temperature protection devices can be incorporated. Foil heaters are designed to suit your application, up to 2000 W/m² with a maximum temperature of 125°C. 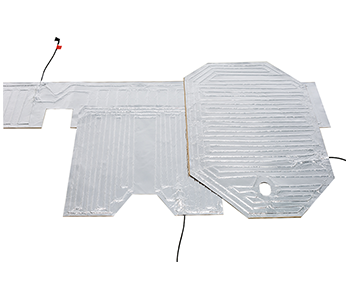 Higher temperatures and increased wattages can be achieved when the foil heater is clamped between two metal surfaces. ‍Any shape or size, double sided foil with optional adhesive on one side, earthed. Thermostat, thermocouple, or other temperature sensor options. Moulded 3-pin plug, IEC plug or cold tails. ‍Custom made silicone insulated heating cable laminated between layers of thick aluminium foil. An adhesive backing on one side of the foil heater is optional. Optional embedded temperature sensor and PID temperature control options available. Three-dimensional objects such as conical, round, or square tanks, pipes etc.